Sell your iPhone 3G 16GB with OnRecycle and get money for your old device. We compare quotations from major phone recyclers, so that you can recycle your iPhone 3G 16GB in just a few simple steps. If you're scouring the internet for the best online stores to sell iPhone 3G 16GB models, don't! OnRecycle is the perfect place to compare iPhone 3G 16GB trade in prices from an array of trusted recycling companies. 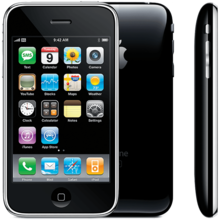 Sell iPhone 3G 16GB models both old and new for brilliant prices right here!